Way back when I was in Djenne, Mali I first experimented with star-lapse photography. I was extremely happy with the result even back then on my first try. Fast forward 2 or 3 years now and I really haven’t done it since. The reason is that I had been reluctant was because I didn’t want to push the sensor of my only camera. Now, however, I have a Canon 6D, and I’ve been using my old 60D for some time-lapse experiments like star-lapse. Moreover, I’ve gotten some really cool products to help me push the boundaries of my time-lapse a little bit. One of those products is called “The Radian” and it is produced by a company called Alpine Labs. What the Radian is meant to do is put your camera on a swivel while it shoots time-lapse. Thus, adding some motion to the footage, which is something that I sorely needed. And, since I can’t travel with a giant slider system, this really is a great alternative. 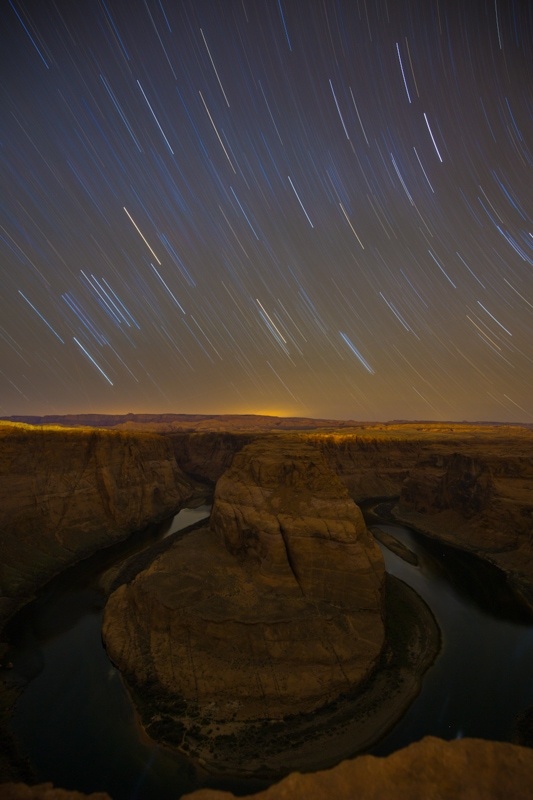 For my first real test of the product, I headed to Horseshoe Bend and shot about 4 hours worth of star-lapse footage over the night. These are the results, and a bit of a review on the Radian. Truth be told, the footage came out grainy, but to no fault of the Radian. Personally, I botched it a little bit. I used my Canon 60D, which works OK. 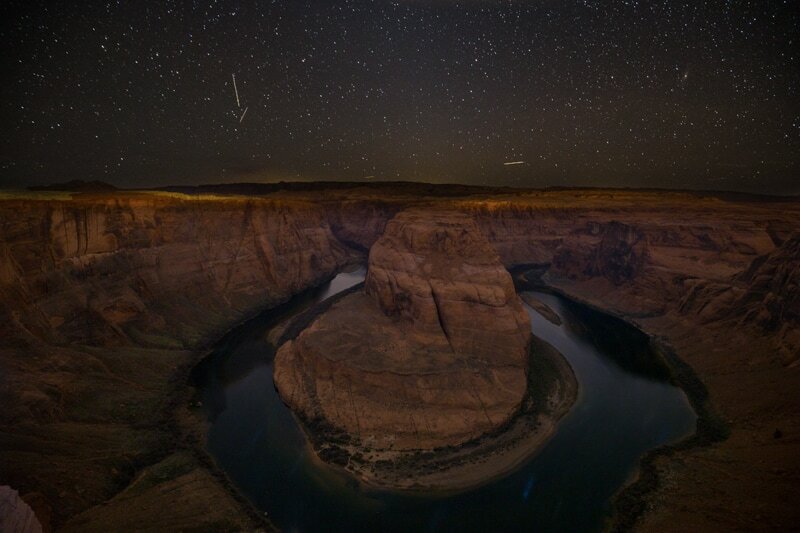 But, to bring out enough light in the canyon at Horseshoe Bend to show any of it, I really needed to push the ISO. As a result, the canyon looks very grainy. If I had used a full frame sensor camera, I would have definitely gotten better results here. The Radian, however, worked perfectly. It created very smooth footage, and the motion looks great. I tested both panning from side to side, as well as using the L-bracket to create a tilting motion, and both came out very well. Download The Radian App: It’s available for iPhone and Android. Of course, my beloved Windows Phone gets snubbed. Choose your Pan: I set up a pan of 45 degrees. You can pan as much as 360 degrees. Select How Often you want to Shoot: I was shooting 25 second exposures, so I fired a photo ever 26 seconds. The Radian doesn’t move well you’re exposing. So, it will fire the camera, wait the length of the exposure, then move, then fire the next images. Choose the Length of Time: I wanted about 10 seconds of footage, so I shot for 2 hours on each of my 2 time-lapses. At a photo every 26 seconds, that was about 280 photos. Link your Camera to Radian: Using the intervalometer cable, connect your camera to the Radian. Upload the Information: Using the phone cable, connect your phone to the Radian. Then, select upload and the information will load onto the Radian and you can unplug your phone and let the Radian do the work. I learned that in star-lapse photography you really are limited by your gear. I would have liked to have had one of those Samyang 14mm f/2.8 lenses for this. It would have given me a full stop of light more and reduced my noise issues significantly. I also think that if I want to do this type of photography on the regular, it has to be done on a full frame camera. 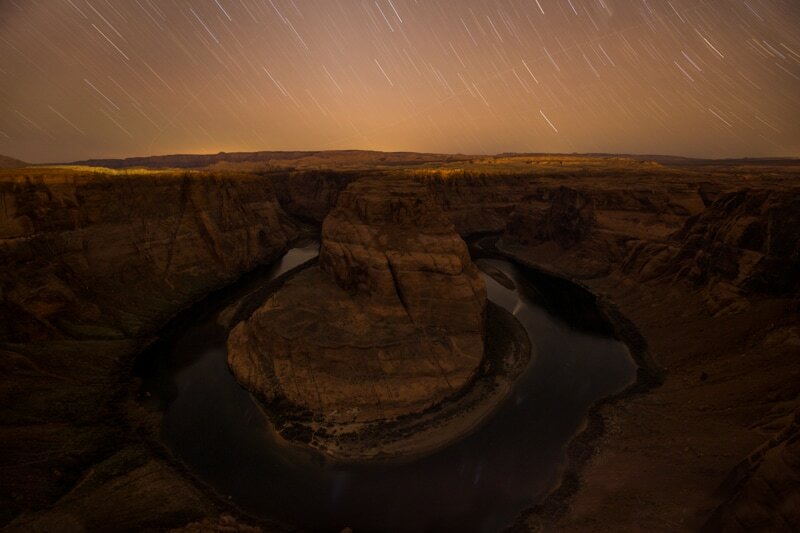 The crop sensor on the 60D is fine for regular time-lapse, but for extreme low-light time-lapse like this star-lapse at Horseshoe Bend, it just doesn’t cut it. I can’t stop thinking of great ways to use the Radian, and believe me, you’ll see a lot more footage within my videos using the product. I think, I’m going to come up with a video on a number of different ways to use the product. So, look for that in the near future. I’m having a lot of fun with the product, and even as I’m typing this article it’s out shooting a 180 degree time-lapse of the view from my apartment. I also think placing it at the center of a table in a restaurant and shooting well we eat, would look fun. Perhaps set up on a tripod in the middle of a square somewhere doing a 360 time-lapse. There are just so many great possibilities. This is literally happening this very second. 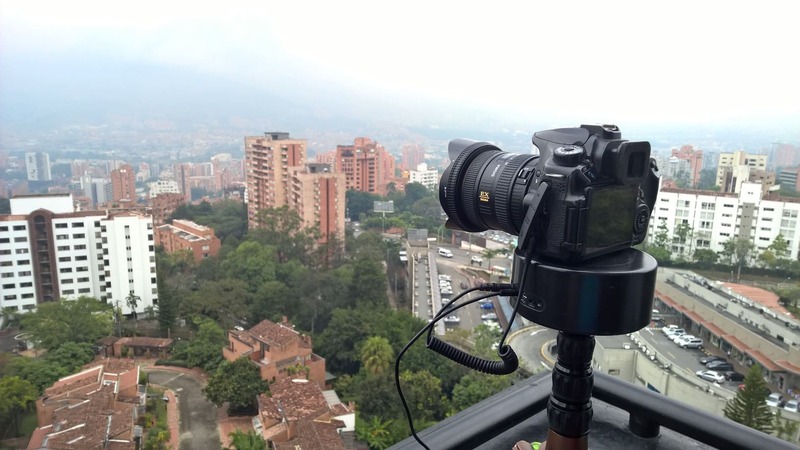 The Radian set up on my deck here in Medellin, Colombia. As you can probably tell by my enthusiasm in the article, I’m thrilled with the product. I think it’s fantastic. My one issue with it is that it doesn’t come with some sort of tripod head adapter. The biggest issue I have shooting it is that I have to keep it flat as it spins or else the footage tilts. That’s fine unless your subject is lower, or you want to capture stars above you and you have to tilt upwards. This can be fixed by placing a tripod head on top of the Radian. However, the screw on the top of the Radian only fits directly into the camera or a smaller Gorilla-Pod style tripod head. A simple adapter would cure this problem. That said, that is really the one and only issue I have with the product. It’s smooth, and the footage I’ve been pulling from it in my various tests has been great. One of the things I really like about it is how small the product is, considering how powerful it is. As a travel photographer, I always have to be conscious of the weight and size of the photography gear I travel with. I have no issues packing this thing around. One of the great things about having two camera bodies now is that I can do two different things at the same time. 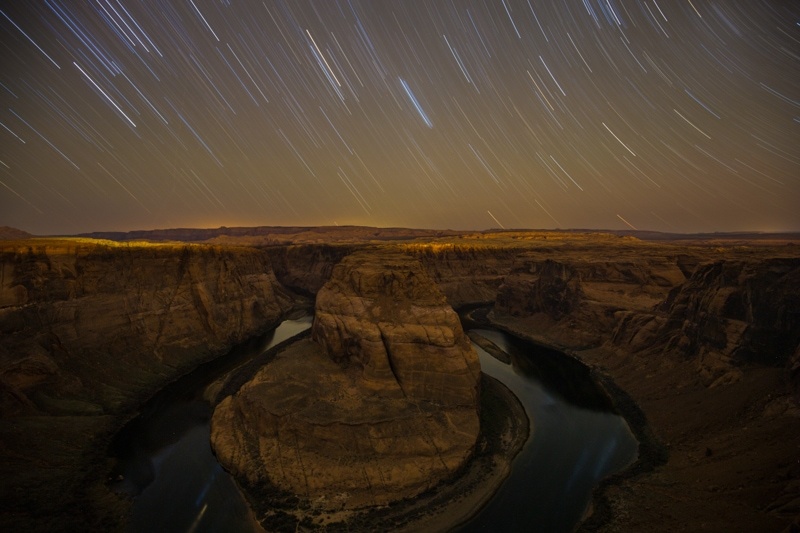 So, well the Radian was doing it’s work at Horseshoe Bend shooting the star-lapse stuff, I was curled up on the ledge of the cliff with my Canon 6D shooting some star photography. I was extremely happy with the results of a couple of my images, so I thought I’d share them. I shot this early in the night, over-exposed it a bit. This is actually two images melded together, a really long exposure for the foreground and a 25 second exposure for the sky. This was an extremely long exposure. If I remember correctly, it was about 40 minutes. The is the same exposure as the other extremely long one. About 40 minutes went into creating this image. Next, I’m off to Las Vegas for a couple days of being completely pampered by the Aria Resort and Casino. We’ve been working so hard lately, that a couple days in luxury are definitely going to be nice. Then, we’re headed to the West Coast for a visit to San Francisco! Stay tuned. That’s pretty cool. I agree that it’d be ideal to attach the tripod’s ballhead to it so you can angle the camera as you want. Good review.